Pakistan Test captain Misbahul Haq disclosed his future plans on Thursday regarding his career as a cricketer. In an interview with BBC, the 42-year-old was asked what his hopes are for the future, to which Misbah jokingly replied that he wants another record to his name by becoming the oldest Test cricketer. “Probably I am ready to make another world record, playing till the age of 50,” said Misbah during the interview. Last month, the Mianwali-born became the oldest player to score a Test century in 82 years when he reached three figures against England at Lord’s Cricket Ground in the first of four-match Test series. The captain then proceeded to celebrate his knock by performing an impressive series of push-ups, that trended throughout the series, which was later levelled 2-2 after Pakistan won against the hosts at The Oval. 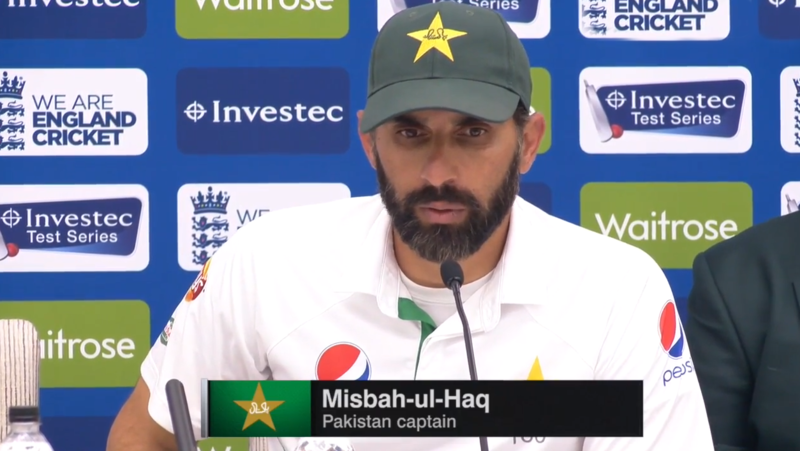 “The Oval win is not only pleasing as it is achieved on the Independence Day, but it will also help us form a legacy for our future Test teams,” said Misbah after the last Test. “When I took over as captain that was my aim, so this win will help me leave a legacy for future Test teams,” he added. Currently, the record for oldest Test cricketer is held by England’s Wilfred Rhodes. He was 52 years and 156 days old when he played the last of his 58 Tests against the West Indies at Sabina Park. Others to play Test cricket despite turning 50 include Bert Ironmonger, William Gilbert Grace, and George Gunn.